24th July 1915, aged 31. Son of James and Mary Gordon, of 44, Partridge St., Glenelg, South Australia. Native of Port Pirie, South Australia. His brother Kenneth Douglas Gordon also fell and is buried in Lone Pine Cemetery, Gallipoli. 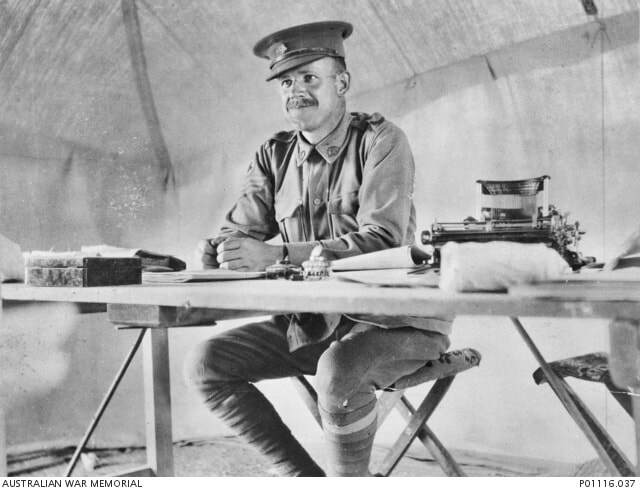 Portrait of 1057 Staff Sergeant James Leslie Gordon, 4th Australia Field Ambulance from Glenelg, South Australia, seated at a desk in his tent at Gallipoli. 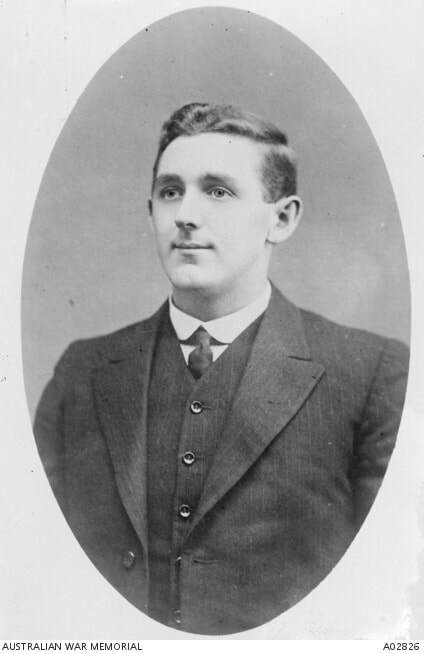 A 30 year old solicitor prior to enlisting in the AIF on 12 September 1914, he embarked for overseas as a Sergeant from Melbourne on 22 December 1914 aboard HMAT Berrima. He was killed in action on 24 July 1915 and is buried in Beach Cemetery at the southern end of Anzac Cove, Gallipoli. 25th April 1915, aged 22. Son of Thomas Walter and Mary P. Green. Native of South Australia. Studio portrait of Captain (Capt) Keith Eddowes Green, 10th Battalion who was a 21 year old shipping clerk from Prospect, South Australia when he enlisted on 19 August 1914. He embarked for overseas from Adelaide on 20 October 1914 aboard HMAT Ascanius. After training in Egypt, the 10th Battalion were amongst the first ashore at Anzac Cove, Gallipoli, at around 4.30am on 25 April 1915. Capt Green was killed in action on that first day and is buried in Beach Cemetery, at the southern end of Anzac Cove. One of 131 photographs displayed on an honour board showing members of the Adelaide Rowing Club who enlisted for active service in the First World War. The original is held by the Adelaide Rowing Club who kindly loaned the board to the Australian War Memorial for copying. INSCRIPTION. NO WAR OR SORROW YONDER ONLY PEACE AND LOVE. 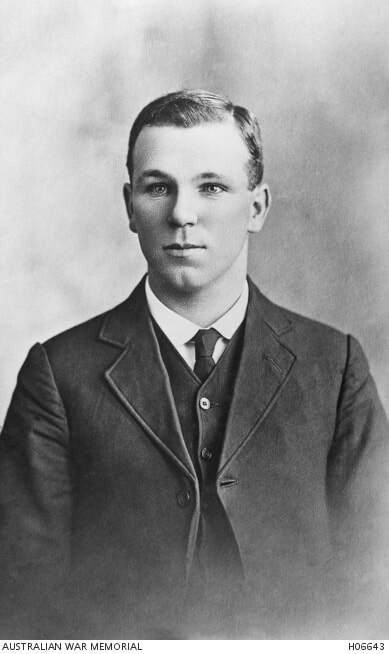 Son of George and Emma Griffin, of Brisbane St., South Brisbane, Queensland. Studio portrait of 442 Private (Pte) William Griffin, 15th Battalion from Graceville, Queensland. A 35 year old commercial traveller prior to enlisting on 26 October 1914, he embarked for overseas with C Company from Melbourne on 22 December 1914 aboard HMAT Ceramic (A40). 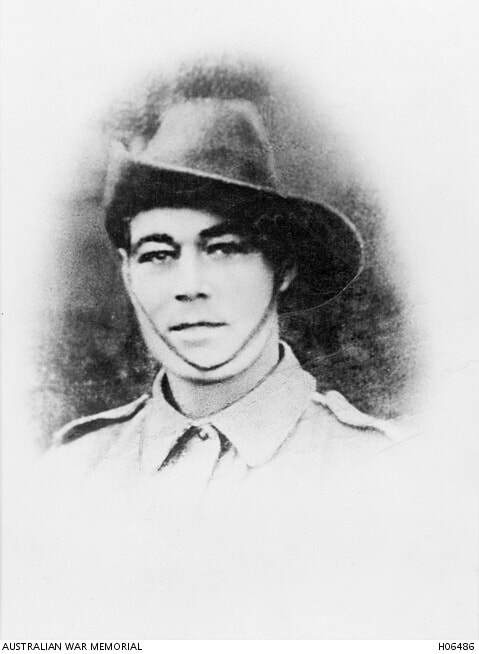 After joining the 15th Battalion at Gallipoli, he was accidentally killed by a fall of earth in a trench on 10 May 1915. Pte Griffin is buried in Beach Cemetery, Gallipoli, Turkey. 19th May 1915, aged 22. Son of Sarah Simpson Kirkpatrick, of 14, Bertram St., South Shields, Durham, England, and the late Robert Kirkpatrick. Private J S Kirkpatrick, served as Private John Simpson and became known as the "Man with the Donkey". 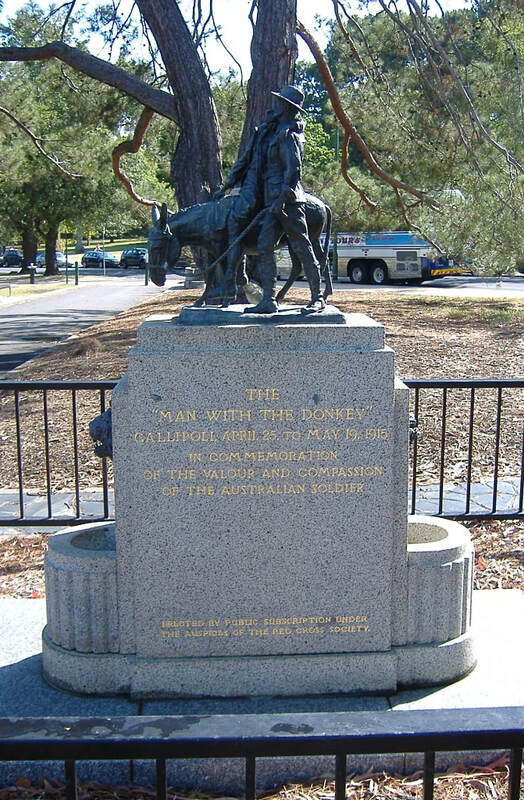 Simpson landed with the 3rd Australian Field Ambulance on 25 April and by the following day he was leading a donkey carrying lightly wounded from the front line down Monash and Shrapnel Valleys to the beach. In the first three weeks of the campaign he became a familiar sight, always cheerful and oblivious of danger. 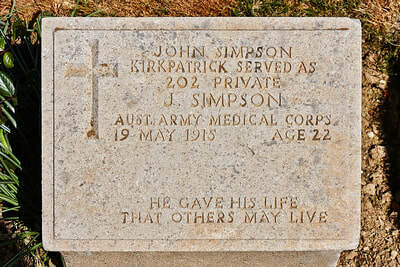 Simpson was killed on 19 May and was Mentioned in Despatches. Killed in action on 28th April 1915. Son of Michael and Rose Ann Ledwidge. Native of Carrathool, New South Wales. 30th April 1915, aged 21. INSCRIPTION. FOR KING AND COUNTRY. Son of William and Isabella Mazlin, of Dublin St., Clayfield, Brisbane. Native of Herberton, Queensland. Studio portrait of 167 Private Leslie Wright Mazlin, 15th Battalion, of Herberton, Qld. A selector prior to enlisting in October 1914, Pte Mazlin and his brother 168 Pte Norman Henry Mazlin, also 15th Battalion, embarked from Melbourne aboard HMAT Ceramic (A40) on 22 December 1914. 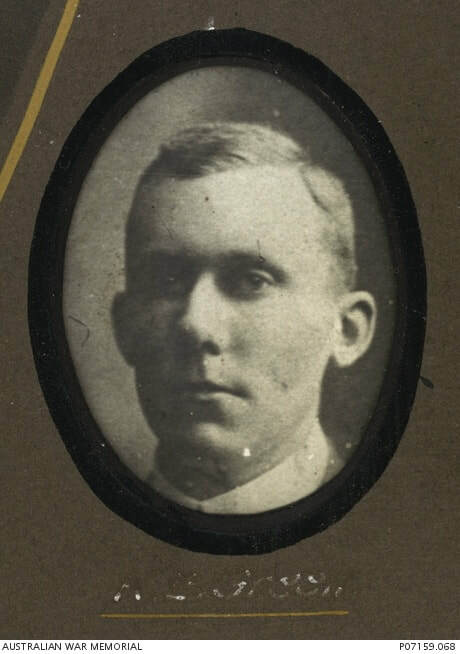 Pte Leslie Mazlin was killed in action at Gallipoli on 30 April 1915, aged 21. Pte Henry Mazlin was killed in action at Gallipoli on 8 August 1915, aged 23 and is buried in Embarkation Pier Cemetery, Gallipoli. Died of wounds on 19th September 1915. 22nd May 1915, aged 24. INSCRIPTION. WE THINK OF HIS LIFE A DUTY DONE NOBLE, UNSELFISH AND BRAVE. Son of Benjamin and Annie Murray, of Tarentta Rd., Borambold, Wagga Wagga, New South Wales. Studio portrait of 32 Trooper (Tpr) Vernon William Murray, Headquarters, 6th Light Horse Regiment, of Wagga Wagga, NSW. 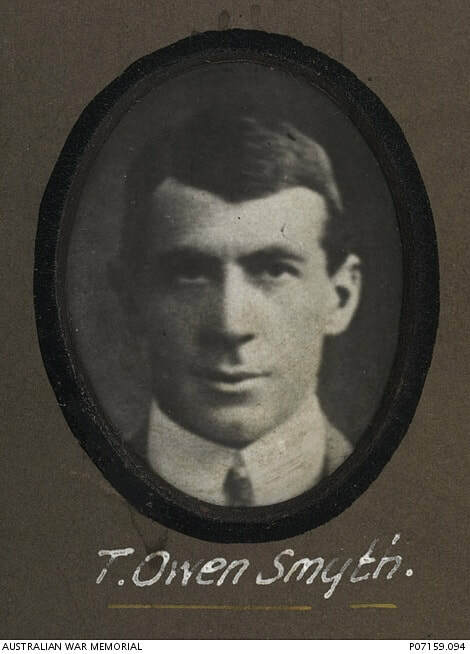 Tpr Murray enlisted on 14 September 1914 and embarked from Sydney aboard HMAT Suevic on 21 December 1914. 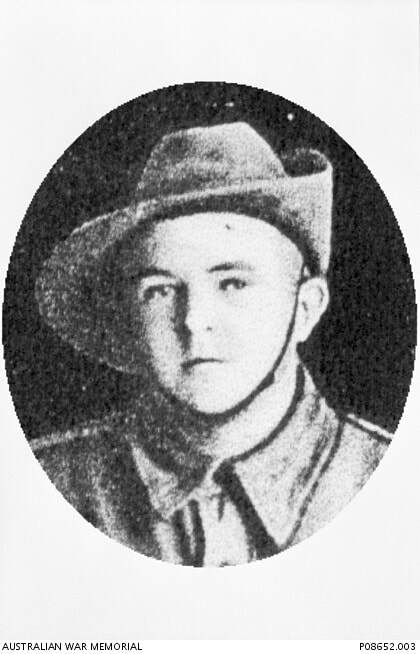 He was killed in action on 22 May 1915 at Anzac Cove, Turkey, aged 24 years. This image was taken from a collage of the descendants of Benjamin Rixon held at P04735.002. Died of wounds on 3rd September 1915, aged 24. INSCRIPTION. FOR ALL HE HELD MOST DEAR. Son of Charles Neaves, of Unanderra, New South Wales, and the late Emma Jane Neaves. Native of Lake Illawarra, Victoria, Australia. Studio portrait of Lieutenant (Lt) Trevor Owen-Smythe, 10th Battalion who was a 28 year old station manager from Adelaide, South Australia when he enlisted on 19 August 1914. He embarked for overseas from Adelaide on 21 October 1914 aboard HMAT Saldanha. After further training in Egypt, the 10th Battalion was part of the covering force for the ANZAC landing at Gallipoli on 25 April 1915 and so was the first ashore at around 4:30 am. 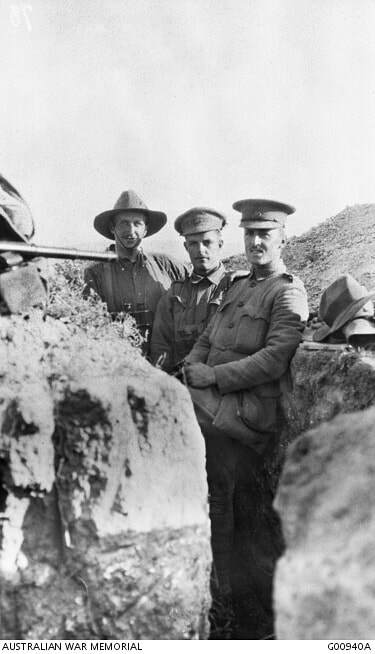 The 10th Battalion was heavily involved in establishing and defending the front line of the ANZAC position, and served there until the evacuation in December 1915. However, Lt Owen-Smythe was killed in action on 16 May 1915 and was buried at Beach Cemetery, at the southern end of Anzac Cove, Gallipoli. One of 131 photographs displayed on an honour board showing members of the Adelaide Rowing Club who enlisted for active service in the First World War. The original is held by the Adelaide Rowing Club who kindly loaned the board to the Australian War Memorial for copying. Died between 20th July 2015 and 24th July 1915, aged 28. Son of Donald Charles and Helena Rankin, of Osborne, Yerong Creek, New South Wales. Native of Tumut, New South Wales. 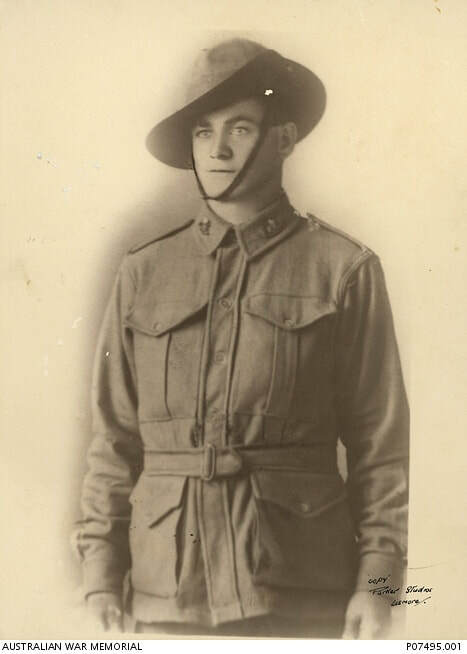 Studio portrait of 2005 Private (Pte) Reginald Henry Bede Rankin, 13th Battalion. The headmaster of Jerilderie Public School prior to enlistment, he embarked with the 5th Reinforcements on HMAT Kyarra (A55) on 13 April 1915. Pte Rankin was killed in action on 20 July 1915, aged 28. 20th May 1915, aged 28. Son of Thomas Arthur and Sarah Jane Rudd, of 30, Henry St., Windsor, Victoria, Australia. Native of Albert Park, Victoria. Pre-war studio portrait of 23 Private William Rudd, 2nd Field Ambulance from Windsor, Victoria. A 28 year old ironworker prior to enlisting on 18 August 1914, he embarked for overseas as a Corporal Cook from Melbourne on 19 October 1914 aboard HMAT Wiltshire. On arrival in Egypt, he reverted to the rank of Private and later deployed to Gallipoli. He was killed in action on 20 May 1915 and is buried in Beach Cemetery, Gallipoli, Turkey. 29th May 1915, aged 23. INSCRIPTION. HE HATH FOUGHT THE GOOD FIGHT FOR GOD HIS KING AND EMPIRE. Son of James William and Kate Allison Siddall, of "Corona," St. George's Rd., Elsternwick, Melbourne, Australia. Outdoor portrait of three naval gunfire observers at a post overlooking Gaba Tepe at Gallipoli. The group includes Lieutenant (Lt) Cyril Albert Clowes, 1st Field Artillery Brigade (1 FAB) and Lt Norman Siddall, 2 FAB. Lt Clowes, a graduate of the Royal Military College, Duntroon, continued to serve with Australian Field Artillery Units throughout the First World War rising to the rank of Major (Maj) and being awarded the DSO, MC and two Mentions-in-Despatches. Maj Clowes continued to serve until his compulsory age retirement on 31 May 1949. 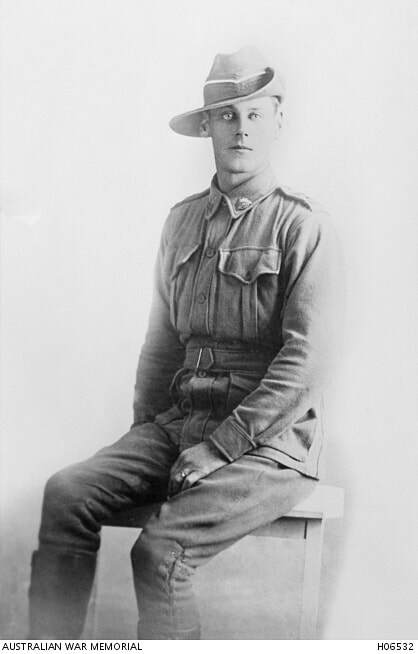 Lt Siddall served with the 21st and 25th Australian Field Artillery prior to enlistment as a Second Lieutenant in mid-August 1914. He embarked with the 2 FAB from Melbourne on 20 October 1914 aboard HMAT Shropshire (A9) for Egypt. The brigade landed at Gallipoli on 25 April 1915. Lt Siddall was seconded as a forward observing officer in support artillery and naval gunfire during the period 28 April to 5 May 1915 for which he was awarded a Special Mention in Divisional Orders for conspicuous gallantry and valuable service. 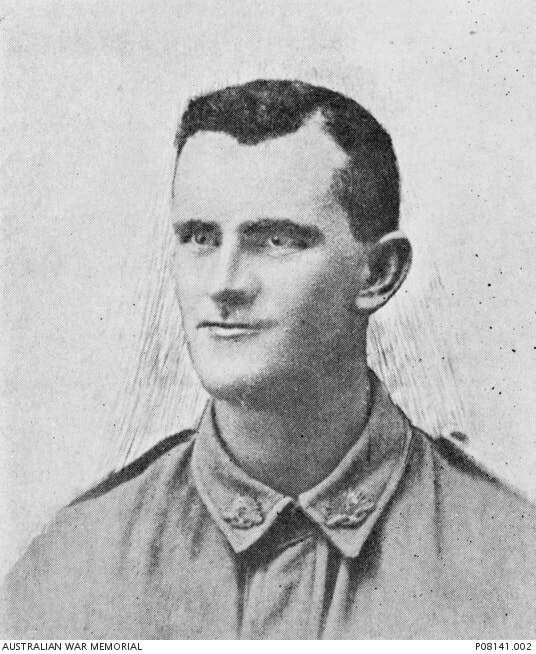 Lt Siddall was killed in action at Gallipoli on 29 May 1915 and is buried in the Beach Cemetery, Gallipoli, Turkey. He was aged 23 years. 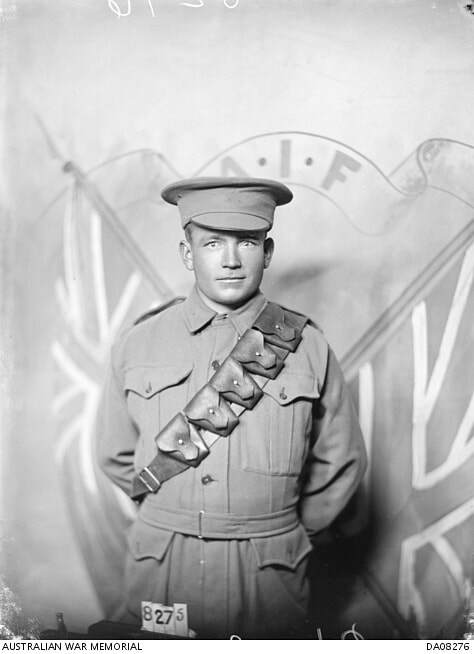 Studio portrait of 951 Private (Pte) Leslie John Simons, 15th Battalion, of Wollongbar, NSW. 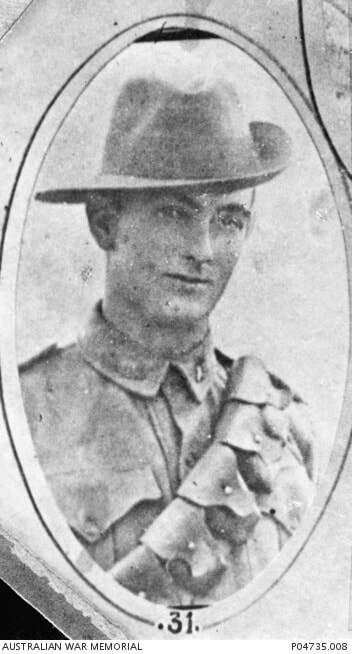 A cook before enlisting in September 1914, Pte Simons left Australia for Egypt in December 1914, and arrived at Gallipoli in the afternoon of 25 April 1915. He received a gunshot wound to the legs at Quinns Post on 24 May 1915 and was evacuated to the 4th Field Ambulance Dressing Station where he died later that day, aged 23.